Mellow Monk's Green Tea Blog: Naked men on the world's tallest elevator? 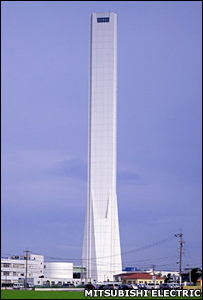 In Inazawa City—home of the Naked Man Festival—Mitsubishi Electric has built the world's tallest elevtor testing tower. The tower is for testing state-of-the-art high-speed elevators for tomorrow's skyscrapers. Just think—when they're done with the testing, the company could turn the tower into an amusement park ride—as long as they please, please keep those naked old guys off the elevators. Uh, sorry guys, you're not getting on the elevator like that.